With a two-month trip to Kenya fast approaching, I’m finding myself struggling to stay on top of everything while manically frying, baking, blending, and cooking my way through the copious fresh fruits and vegetables I’ve purchased in the past couple weeks. Baking is always a sure bet when there are mounds of dangerously ripe fruits piling up on counter tops and refrigerator shelves. This recipe gobbled up five nectarines and two cups of blueberries like it was no big thing and spit them out in the most delightfully juicy and flavor-filled way. Even though the recipe I followed to make this treat was for “crumb bars,” the end product was really more of a fruit-filled shortbread coffee cake. Since I used a dish with dimensions smaller than the 9×13 the recipe called for, the result was this thicker, juicier cake-like version of the dessert, bursting with the flavors of summer. And boy was it good. Preheat the oven to 375ºF. Generously grease a 9×13″ glass baking dish (my dish was smaller than 9×13, so it made thicker bars – which is great! Though requires slightly longer bake time). 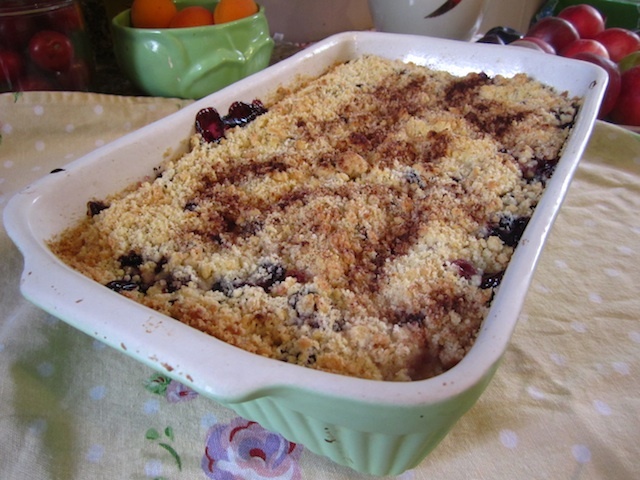 In a medium bowl, gently toss together all of the fruit filling ingredients except for the bluberries and set aside. In a large bowl, whisk together the 3 cups flour, 1 cup sugar, baking powder, salt & 1/2 teaspoon cinnamon. Using a pastry cutter or your fingers, cut in the cold butter until the mixture resembles coarse crumbs, with some pieces the sizes of peas. Press half of the dough into the bottom of your greased baking dish. 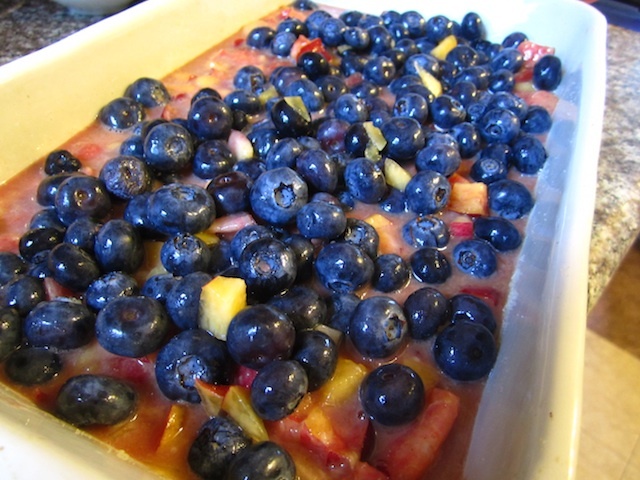 Spread the fruit mixture over the crust. Sprinkle the blueberries on top. Crumble the rest of the dough loosely on top of the fruit. Sprinkle evenly with the remaining 1 teaspoon of cinnamon. Bake for 35-45 minutes (longer if your dish is smaller than 9×13), until the crust is golden brown and the fruit is bubbling. Serve warm or cool completely and refrigerate. These keep well and are absolutely delicious the following day too! 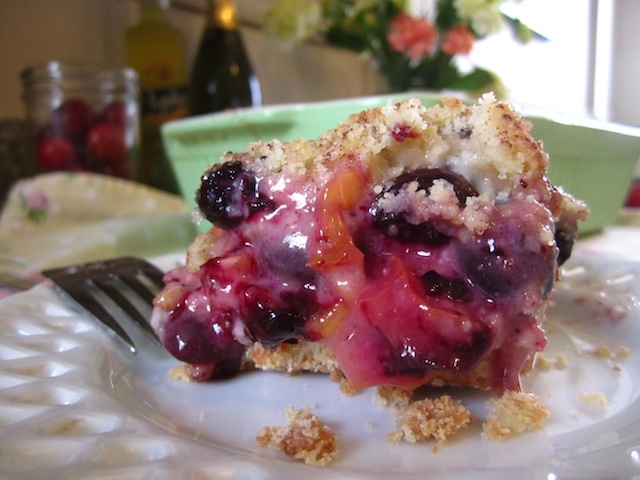 This entry was posted in Not pie and tagged blueberry, crumb bars, nectarine. Bookmark the permalink.